I write a lot in this space about my sweet mama, and how much I miss her since cancer snatched her away in October 2006. I don’t write as much about my dad, and today, on Father’s Day, it’s high time I remedied that inequity. My dad and I are a lot alike: opinionated, confident, and possessing a strong sense of right & wrong. He was the originator of the “it’s just what you do” idea. He lived it and preached it. One of his many sayings is “Good things happen to people who get up and go to work every day.” He instilled a rock-solid work ethic in my brother and me, and that is one of the many things for which I’m grateful to him. It all started, I guess, when my dad’s dad, Elias “Louis” Katapodis, was born on July 20, 1893 in the village of Haradiatika, on the island of Levkas, in western Greece off the Ionian Sea. Life was hard, and Louie wanted more. At age 21, Louie emigrated from Greece to the United States in pursuit of a better life. He and his brother John (for whom my brother is named) departed the port of Patras, Greece, on the passenger ship Patris and arrived at Ellis Island April 5, 1914. I have copies of their ship’s passenger list as well as Louie’s Petition for U.S. Citizenship, dated January 19, 1925. 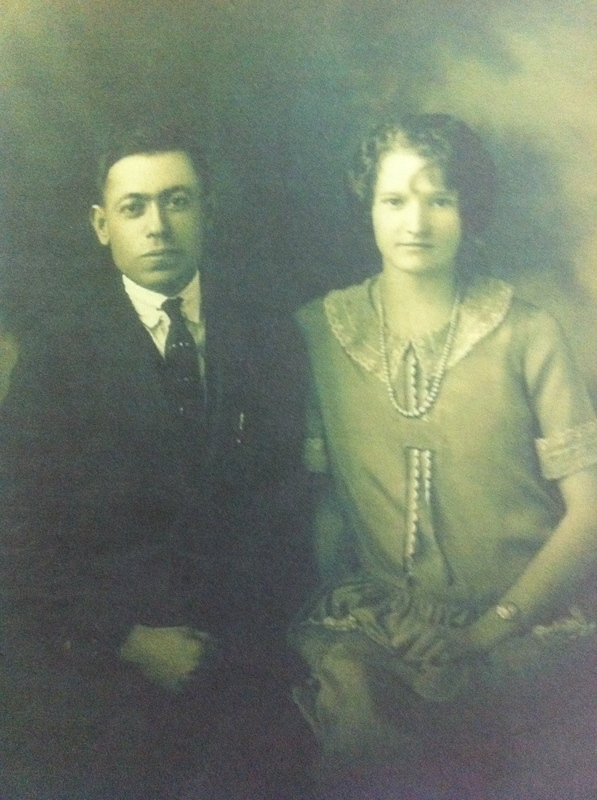 After landing at Ellis Island, Louie and Uncle John traveled to Iowa to work on the railroad, and Louie ended up in Sapulpa, Oklahoma, where he met Mona Mae. He married her and they and had 3 boys. 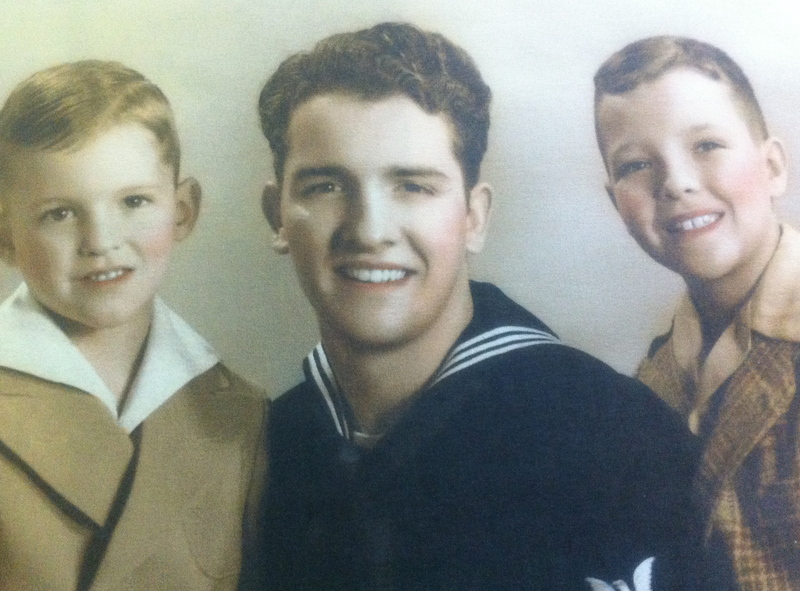 My dad, Leon, was the middle child, on the far right. Louie was immensely proud of his U.S. citizenship, and apparently hung the framed document in his bedroom. He had just enough formal education to read the newspaper and pass the citizenship test, but he could never read cursive writing, and neither he nor Mona Mae ever learned to drive a car. Louie learned enough math to work a cash register, and worked hard. He had a reputation as a prankster and was always smiling. Sadly, Louis died before I was born so I never met him but I’ve heard about what a great man he was. He came to the Unites States speaking little English and with very little money, but with hard work and determination–the typical immigrant story–he prospered. He raised his boys to love their family and their country, and he instilled the value of a good education. He taught my dad how important it is “to keep your nose clean” and he wasn’t talking about hygiene. My dad passed that lesson on to my brother and me, and I distinctly remember him talking about how his greatest fear as a child was that he would disappoint his dad. Me, too. 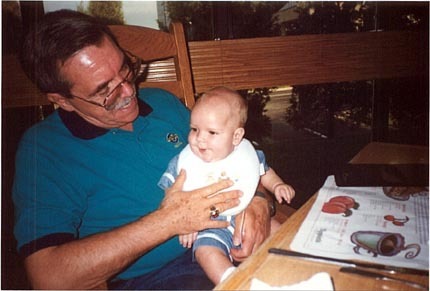 One of my great regrets is that circumstances never allowed me to meet Louie, my Papou, but I’ve been told my entire life that he would have loved me, and I’m sure the feeling would have been mutual. My dad was a star athlete, excelling in both baseball and football. He passed that trait on to his grandkids, no doubt. 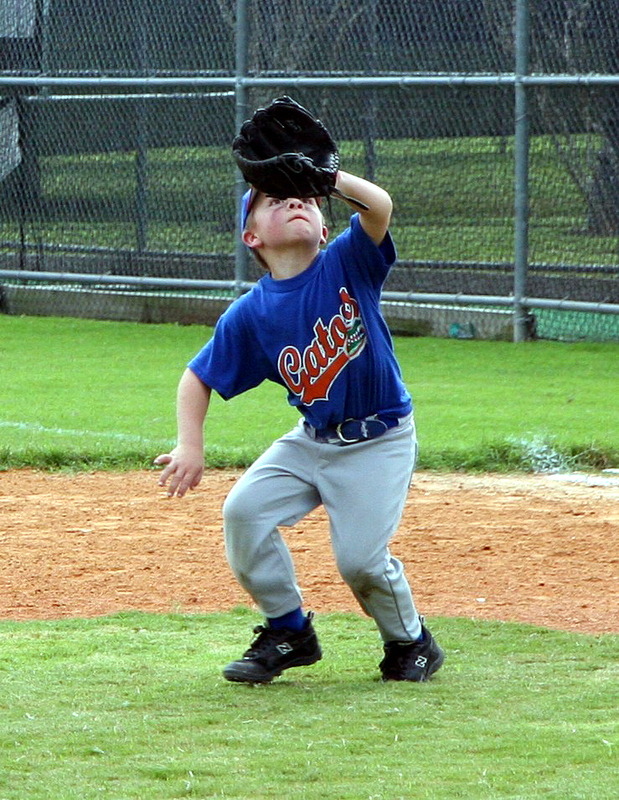 In fact, my dad taught Payton to hit a pitched ball at age 2, and perhaps started Pay’s lifelong baseball love affair. 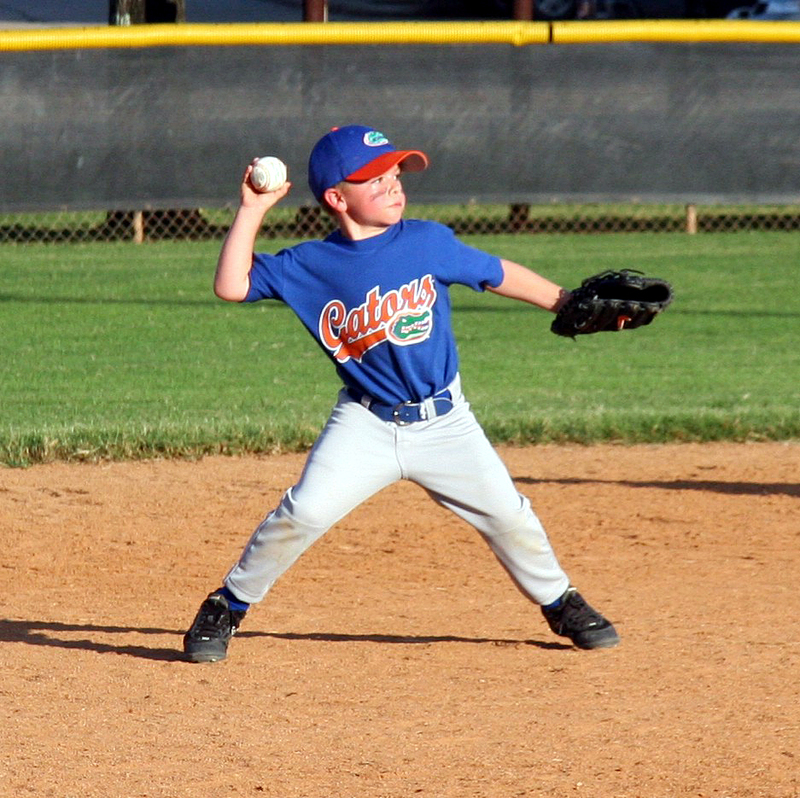 Thanks to my dad’s genes and tutelage, Payton looked like this on the ball field, even at a young age. My dad not only passed on the baseball legacy but also loves watching Payton’s games. 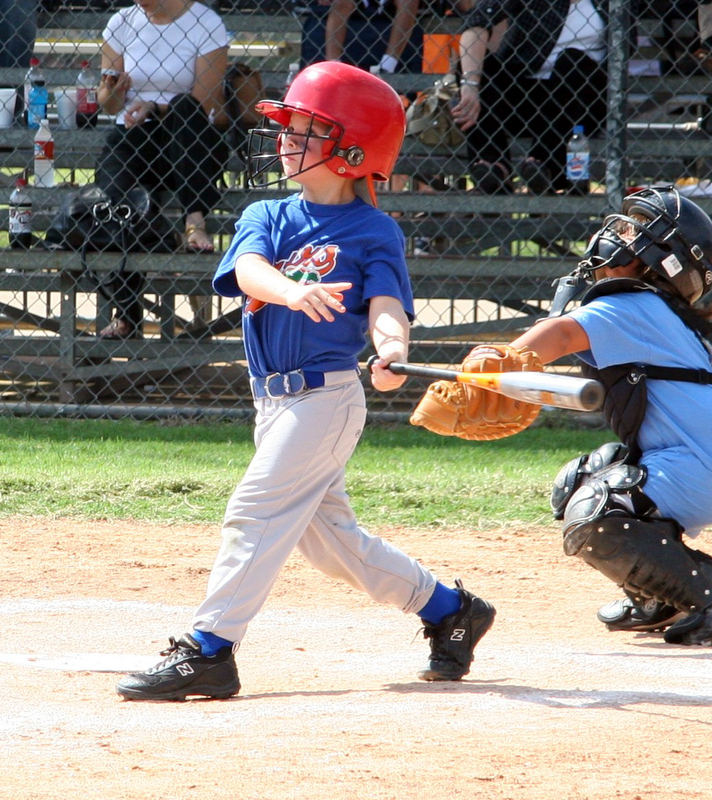 He thinks nothing of traveling 525 miles one way to be in the stands for Pay’s Little League games and for Pay’s year-round team’s many tournaments. Last year, Dad traveled to watch Pay’s All Star team in the State Championship in Tyler, TX, cheering them on while I was stuck in yet another hospital room. 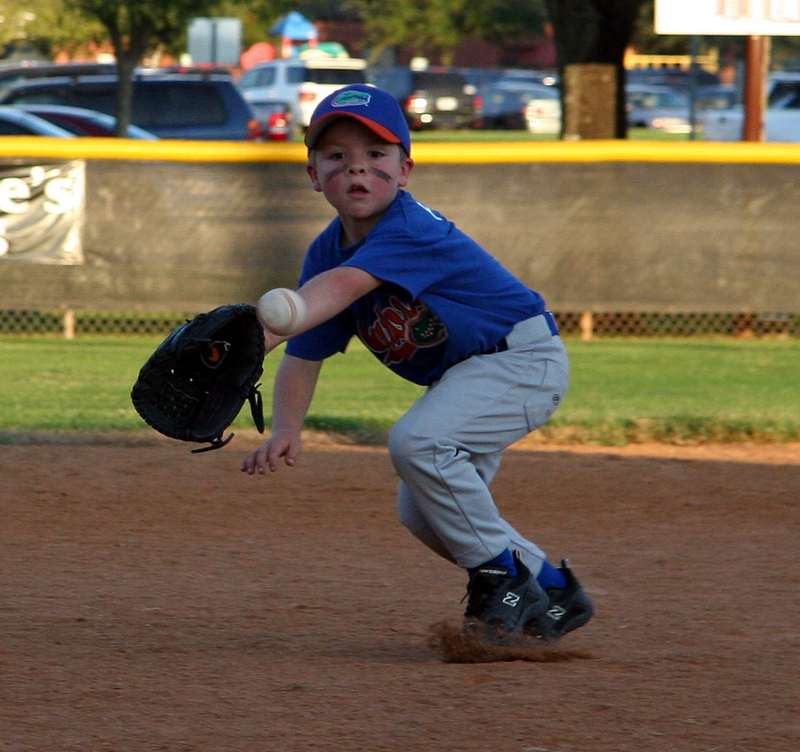 Watching Payton play baseball is one of my dad’s favorite things, followed closely by hanging out with his grandkids. 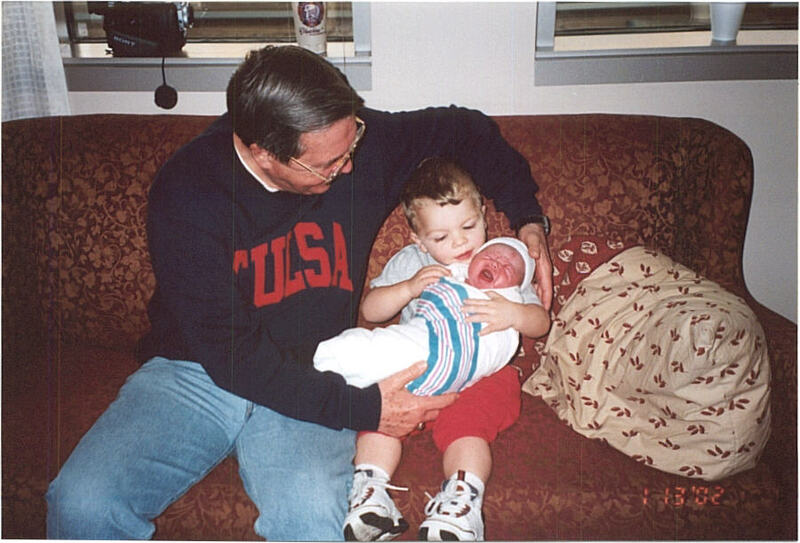 He’s been there from Day One in each of his 4 grandkids’ lives, and in fact, on the day that Payton was born, Dad was visiting my nephew Andrew in Kansas. When he got the word that Pay was making his appearance into this world a few weeks early, he jumped in the car and high-tailed it across 3 states to meet his second grandson. When Macy was born, he kept Payton for us and when the coast was clear and she was safely delivered into the world, Dad brought Pay up to the hospital. I will never forget watching him standing over her incubator with a tear of joy rolling down his cheek. Wish I had a photo of that! 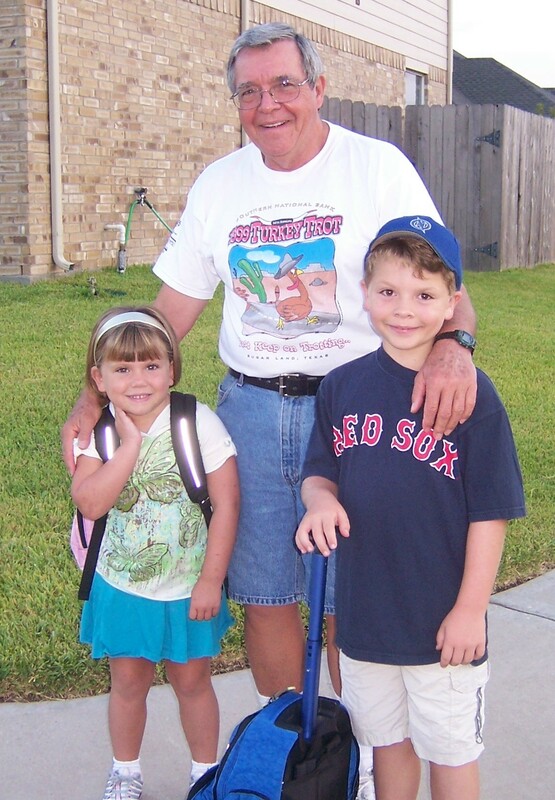 He never got tired of holding his grandbabies, and he’s logged a lot of hours chasing them around playgrounds, taking them to the zoo, and relishing their company. I love how you can see Dad just over Andrew’s shoulder in the left corner of this photo. 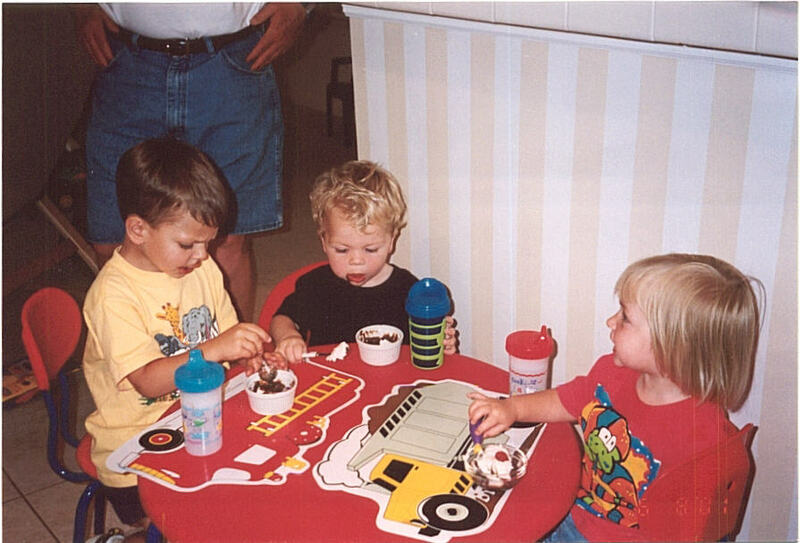 Three cousins having a snack while their Papou watches over them is pretty good stuff. My parents loved their grandparent role immensely, and I know my dad is as sad as I am that YaYa didn’t get to see her grandkids grow up. and he’s been around for the first day of school. 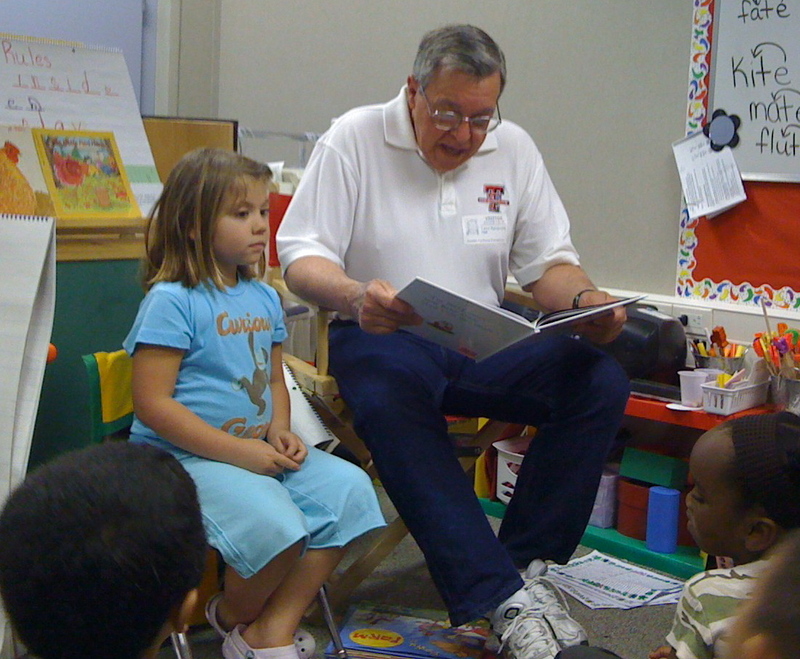 He was proud to be a featured guest for kindergarten read-aloud, and Macy was so happy to have him there. 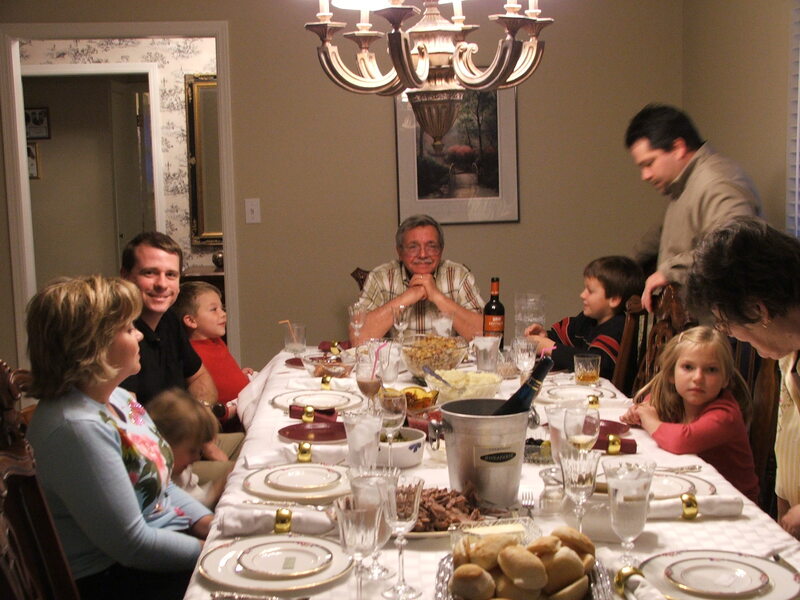 Holidays are a special time for my dad, and he loves to have everyone gathered around a table laden with good food. That first Thanksgiving after my mom died was brutal, but even though it had only been a few weeks since he lost his beloved Bride, he insisted that the show must go on and he proudly presided from the head of the table. My mom would have liked that. 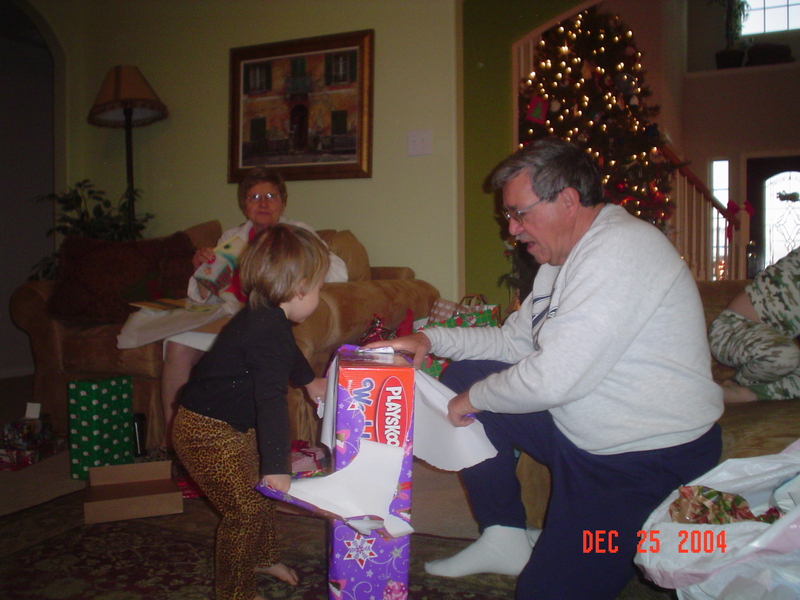 Every Christmas, the biggest and best gift comes from Papou, and he’s always there to gather up the trash, insert batteries into new toys, and open the wine and carve the roast beast. My dad has taught me a lot of things over the years, from looking both ways before crossing the street to the satisfaction of a job well done. He’s been a guiding influence for my brother and me in how we raise our families. He set the example we follow in parenting: love your kids, teach them well, call them out on their wrongdoings, and have lots of fun. He used to give me his chewed piece of Juicy Fruit gum every evening when he got home from work. The germ-o-phobe I grew up to become would never chew someone else’s already-chewed gum, but as a kid I didn’t think twice about it, and it seemed like a special ritual between the two of us, one of many special things we shared. He sang “You Are My Sunshine” to me every night before bed as he tucked me in. When my mom was diagnosed with cancer, he was by her side every step of the way. When it became evident that her cancer battle was one she would not win, he faced that cruel truth head-on; a great and important lesson for me and one that I would employ just a handful of years after her death. 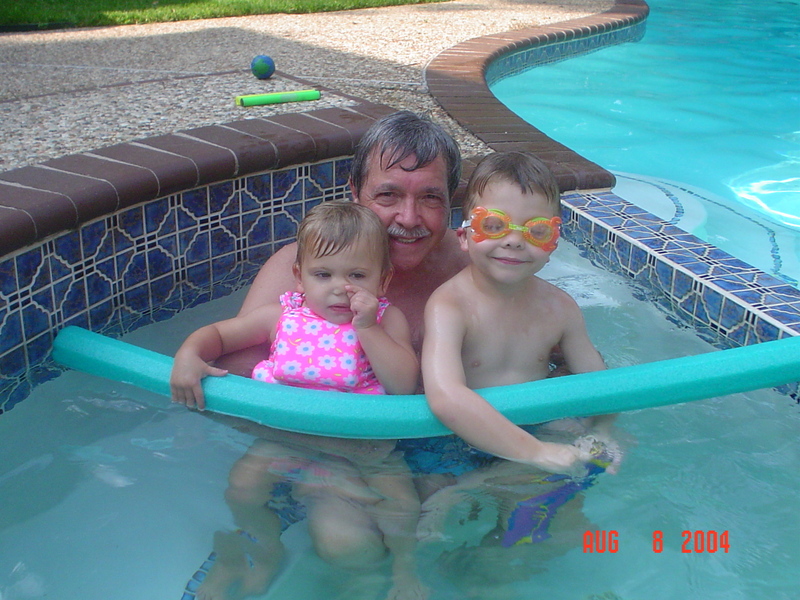 If it freaked out my dad to learn that his little girl also had cancer, he never let on. He simply told me that he had every confidence that I would map out a plan to deal with it and execute that plan. He has supported and encouraged me, never missing an opportunity to tell me how proud he is of how I’ve waged my battle, and reminding me that my mama would be proud, too. While I no longer need my nightly song and tuck-in, I still love my daddy and feel so grateful to have him in my life. Happy Father’s Day to all the daddies out there. What a wonderful tribute to a wonderful dad! He sounds like such a special person. 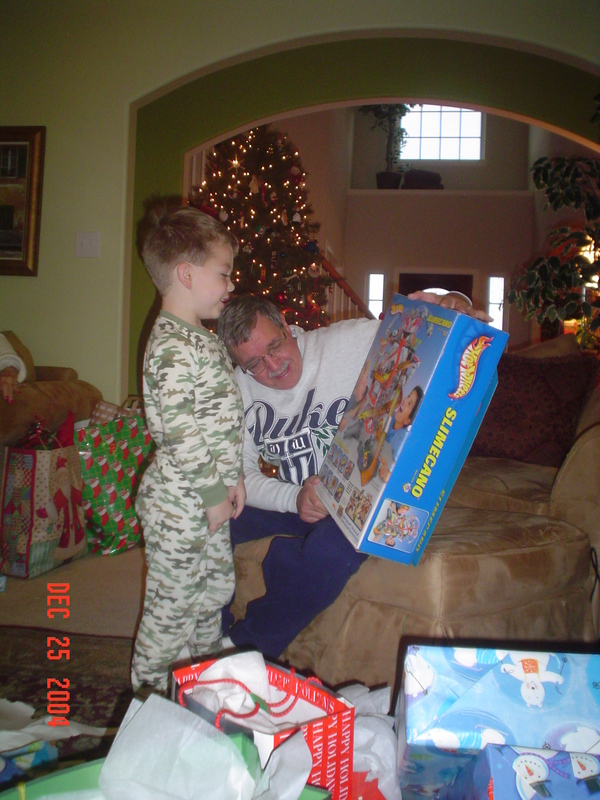 I miss my Dad so much; he’s been gone for over three years now. But I’ll never forget what he taught me, many of the same things your Dad did. The work-ethic was one of the most valuable. Those nightly songs and tuck-ins will always stay with you. I echo your closing dedication: Happy Father’s Day to all the daddies out there. 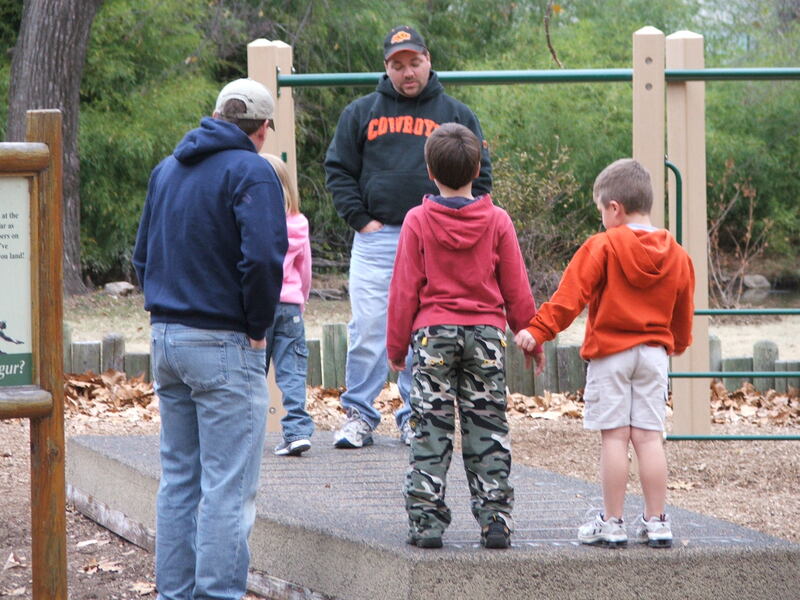 Thanks for sharing with us all the special attributes of your Dad today. Wow! What a special Dad you have. My father grew up in a military boarding school and therefore, wasn’t warm and fuzzy. My husband, James, and his Dad were a lot like your Dad. They thought nothing of driving clear cross creation and back if it meant they could spend time with their family. I’m thinking a lot about James and his Dad today, so thank you for this post, for letting me know there are other special men out there. I love your dad! He’s a special guy for sure! I couldn’t help think about his 18 year old jeans…..wonder if they are in any of the pics you posted? Have a great Father’s Day, Leon! Mandi — when’s your surgery? Been thinking about you. Are you in the triple-digits for consecutive days with stitches?